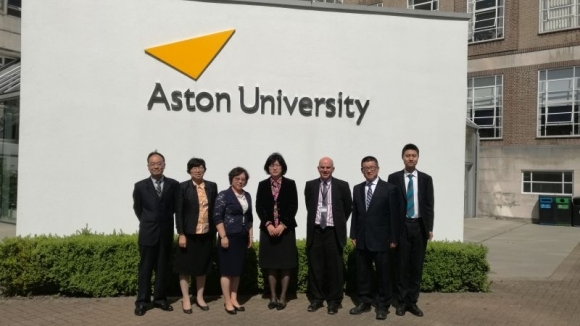 At the invitation of the Aston University, the delegation of Nanjing University of Finance and Economics visited Aston University from 25th May to 26th May, under the leadership of Professor QIU Weifen, Vice President of Nanjing University of Finance and Economics. On 25th May, the delegation arrived in Birmingham, they were welcomed by Mrs. Jenny WANG, the General Director of AEMG, and other AEMG staff. During the meeting, the two parties had a detailed consultation about the ongoing joint research programs and reached a broad consensus with regards of cooperation in the future. On 26th May, Director General Mrs. WANG Jing from AEMG accompanied the delegation to visit Aston University. Prof. Alec Cameron, Vice Chancellor and President of Aston University, Prof. Fiona Lacey, acting Pro Vice Chancellor who host and met the delegation. The two parties exchange some ideas for the issues of student service and personnel training. After the meeting, the delegation were invited to visit the center of students’ innovation and entrepreneurship in Aston University. The two parties had a detailed consultation about the application of program of students’ innovation and entrepreneurship.